Billed as a tale in the vein of Chronicles of Narnia, and dedicated to CS Lewis. Nice story, but not on the scale of Narnia. Some lovely color plates to illustrate it, though. so this was not good. i'm not even going to bother talking about the book. what i WILL say is how wonderful that tiny, little thrill was when i saw and half-barely remembered the cover. i didn't remember anything about the book itself (and didn't remember anything while reading it either), but when i saw the cover it triggered a brief flash of discovering something magical. 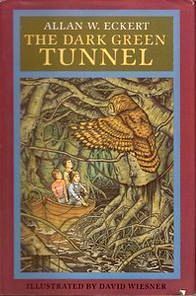 what i don't know is if i was REMEMBERING the thrill from when i saw/read the book years and years ago (4th grade is when luke read it, so i'm guessing it was then for me too) or if the thrill came from the remembering of something soooooo long forgotten. luke and i youtubed the 80's commercials for Big Red and Doublemint Gum last night (my new toothpaste reminds me of Big Red, as if that makes this anymore relevant to my Dark Green Tunnel review) and watching them was SHEER DELIGHT. "A double pleasure's waiting for you! A double pleasure with Doublemint Gum!" Great book that my parents read to me when I was younger. I remember reading it a bit when I was in 5th grade as well. I always thought it was weird how they were grown-up in the world they went to but then came back and were kids again. When you're young, things like that are magical. I remember the wonderful full-page color images in this book too. For someone that didn't have cable TV, that was pretty cool. a reread of a young adult fantasy book. My 6th grade teacher read this (and its sequel) aloud to us and we were all rapt. Something made me think about it and track it down. Very similar to the Narnia/ CS Lewis books, but nowhere near as well written. Sad to say, but it doesn't really work to read as an adult, as it is too formulaic and superficial. (Unlike CS Lewis who writes for all ages). I'm still going to reread the sequel too. Artificial and rather sterile children's fantasy by a Floridean who read The Lion, the Witch and the Wardrobe too many times. Mom read this to us when we were kids. Had to check it out when I saw it at the library. But you need to find the out-of-print version at libraries because the ones do not have the pictures in them.